The U.S. adaptation of the Danish TV series 'Forbrydelsen' will have a March Blu-ray release. 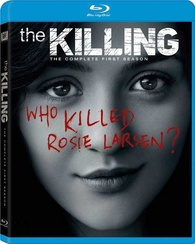 In an early announcement to retailers, 20th Century Fox has just revealed 'The Killing: The Complete First Season' will hit the Blu-ray format on March 13. The AMC original crime drama series from the producer of 'Cold Case' revolves around the hunt for a teenage girl's killer and stars Mireille Enos, Joel Kinnaman, Billy Campbell, and Michelle Forbes. The 3-disc set will feature 1080p video, a DTS-HD Master Audio 5.1 soundtrack, and supplements include: audio commentaries on the pilot and season finale, extended cut of the finale, Autopsy of The Killing, deleted scenes, and a gag reel. You can find the latest specs for 'The Killing: The Complete First Season' linked from our Blu-ray Release Schedule, where it's indexed under March 13.